You may remember a couple of weeks back I wrote a post on chocolate-coconut biscotti? In order to get the recipe right I ended up with a massive pile of rejected 'experiments'. To be fair, they were okay and in content were not that much differently made to the final version, but they just weren't quite right. 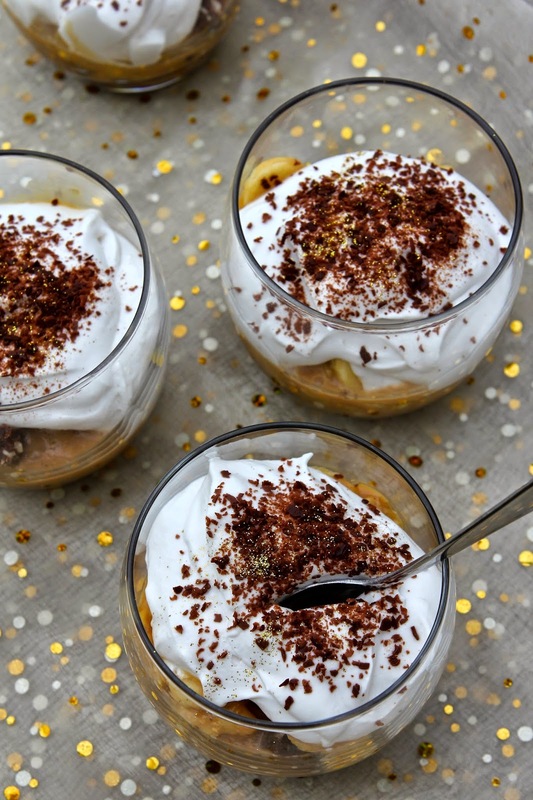 Banoffee-Coconut Crunch Trifle perhaps? Oh yes! What a very very happy accident! Don't you just love kitchen alchemy? Actually, I will be honest............ I didn't intend to make a trifle at all, but thought I would make a biscuit base (as with cheesecake-type puds) and then layer with banana-caramel and cream to make a sliced tray 'bake'. Realising that the caramel (Carnation variety) was way too runny to 'hold' in the layer and not having time to make anything different, I had to adapt my plans and decided trifle would be the most straight forward option. Trifle is always such a fab user-upper of stuff! It takes wet, soft, runny, spongy and crunchy ingredients in any combination and providing the flavours work, it is always a winner. The biscuit base here, has been made with coconut oil in substitute for butter, as I thought it may be a little healthier and would also enhance the coconut in the biscuit. Concerned that the crushed biscotti may be too rich against the caramel, I balanced the mix slightly with a few crushed gluten free digestive biscuits which are widely available in supermarkets, then threw in a handful of extra chopped nuts and some desiccated coconut for good measure as additional texture and flavour. This base is amazing.... really! It made a whole new biscuit invention in itself......... crisp, crunchy and full of the richness of chocolate and tropical coconut with a nutty crunch. Roughly chopped, it has been layered with bananas and Carnation Caramel before topping with my first attempt at whipped coconut cream. I have been wanting to try whipped coconut cream since I got Aimee Ryan's book Coconut Milk Ice Cream. Looking on the internet, there are many recipes out there which mirror the one in Aimee's book, but as I trusted Aimee's judgement, I used her recipe, sweetened with maple syrup and was not disappointed. Coconut cream is way healthier than usual dairy cream and is much lighter when whipped, making the dessert much less heavy on the stomach and quite delicious. 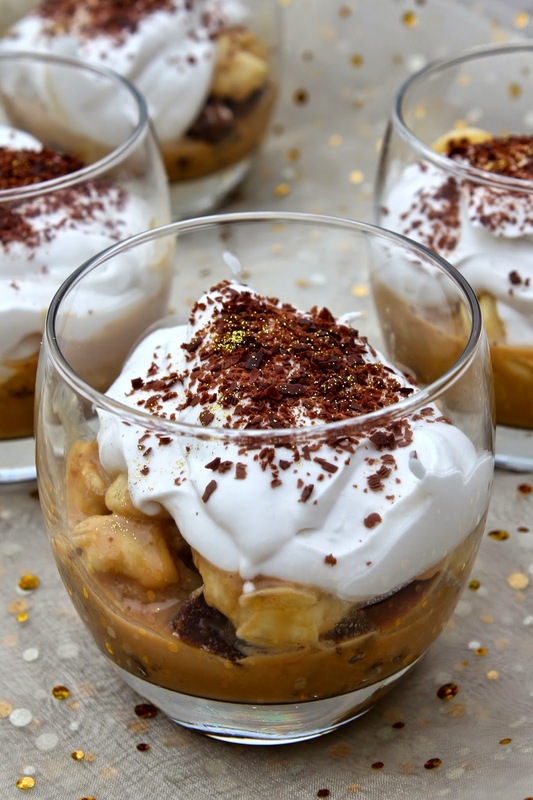 There is a slight coconut taste about it, but as this trifle had a number of other coconut elements, that factor seemed irrelevant to the overall result. My only criticism was that the cream did not whip particularly stiff so would not have held its shape well if piped. All in all though, this dessert is wonderful...... the combination of flavours works incredibly well and surprisingly for a trifle, does not make you feel over-full. I am entering it for August's No Waste Food Challenge, this month being guest hosted by Laura at 'I'd Much Rather Bake Than....', (on behalf of Elizabeth's Kitchen Diary) on account of it being my rescue plan for those biscotti rejects! Laura is so right when she says that some of the best recipes result from being forced to come up with an idea to use up an ingredient. Well this is no exception! I will absolutely be making the biscuit base again...... maybe next time for a cheesecake or as the base for a flan. 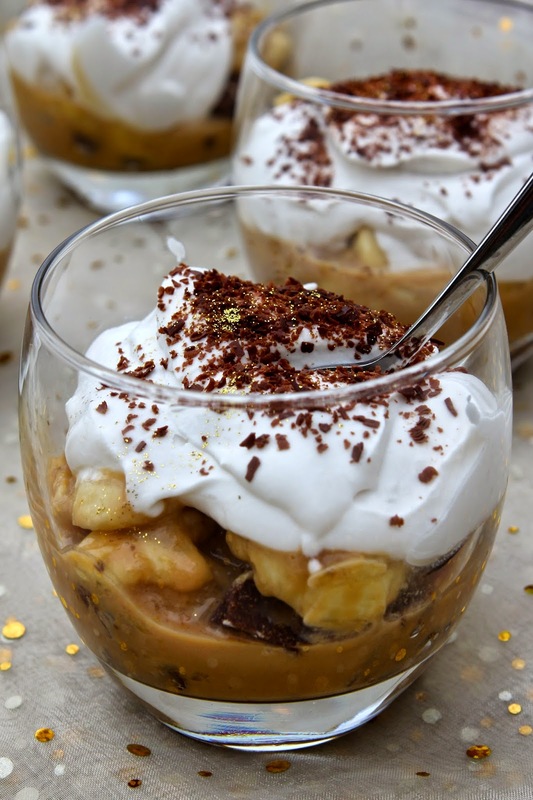 And although I would not naturally have considered combining chocolate, coconut, banana and caramel, it is a dream to eat and could well inspire many further desserts. Base-line a 20 cm/8 inch loose-bottomed square baking tin with baking paper. Melt the coconut oil in a large bowl either in the microwave on a low to medium setting for a few seconds, or over a pan of simmering water. Remove from the heat and add all the other ingredients. Mix thoroughly. Spoon the mixture into the baking tin and flatten evenly with the back of a spoon. Chill in the fridge until hardened. When cold and hardened, remove from the tin and cut into small squares. Set aside. 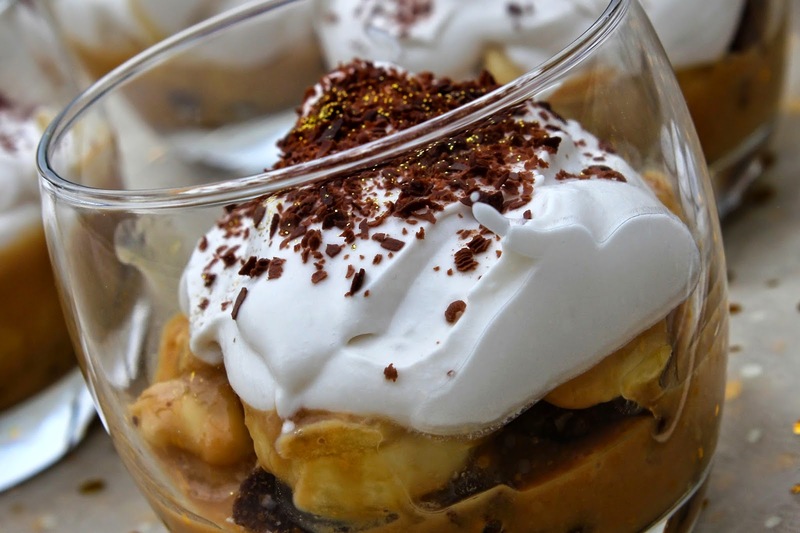 Mix the caramel with the bananas and set aside until ready to assemble the trifle. Whip all the ingredients until thickened. Use either a medium-sized glass serving bowl or individual serving glasses. Line the base of the bowls with a handful of biscuit-base pieces. Spoon some Banoffee filling onto the biscuits. 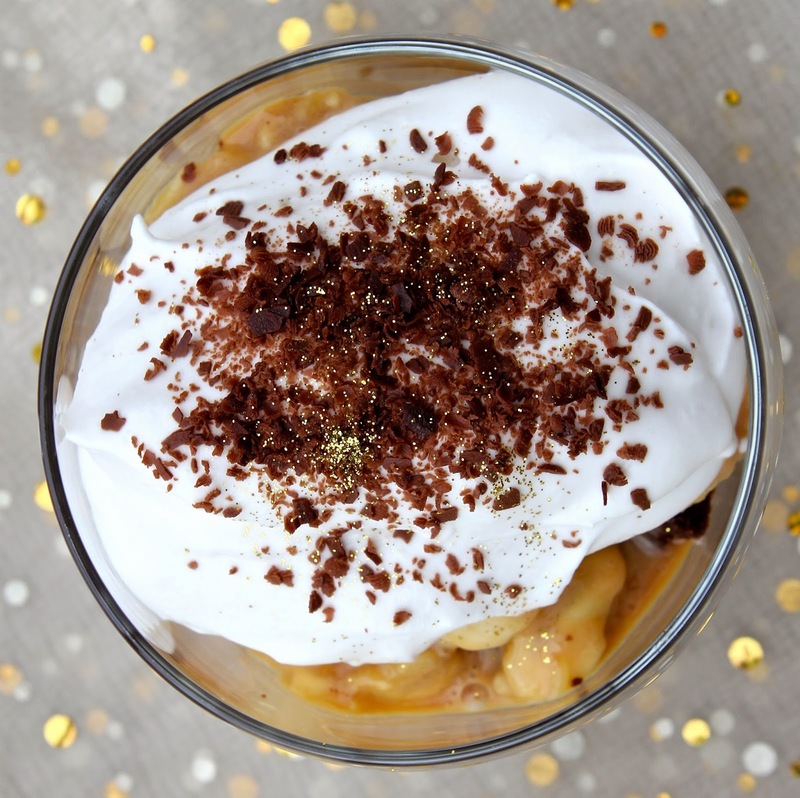 Top with dollops of coconut whipped cream and a sprinkle of grated chocolate. Oh my god. I want one of these right NOW. In fact make that a NEED. I don't know what to say, they sound simply divine. Thanks Laura. I need one now too! But they are long since gone..... Will just have to make another load! Great use of your biscotti. 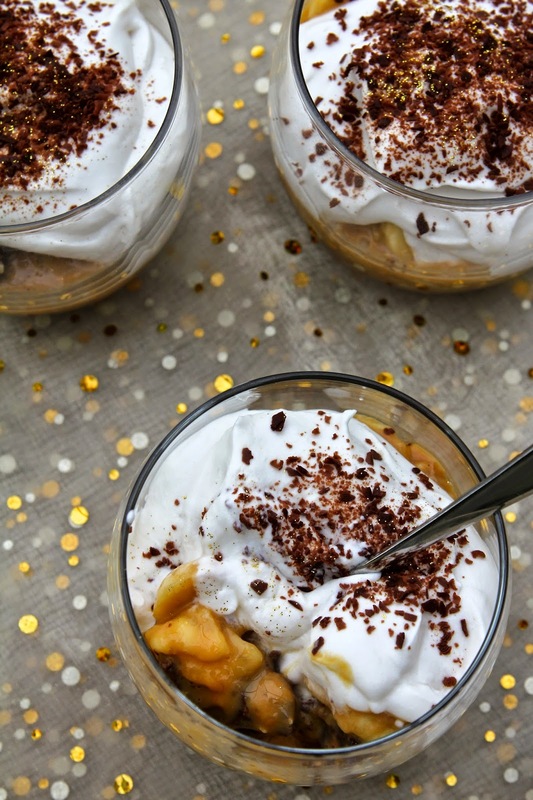 I love banoffee pie and I'd happily eat this banoffee trifle- yum! Thank you Katie. Yummy indeed! I Love it when 'failures' get a fab new lease of life - these look great! I know..... doesn't it just make failing worth all the frustration?! This is a lovely and very well presented dessert! I love banoffee pie. Well done!! Thanks Alida! It was pretty much thrown together, so it's good to hear it looks better than that! This looks fantastic - I wish I could gobble up some it right now!